It looks kind of like rhubarb, but I don't think rhubarb has those pods...how strange! 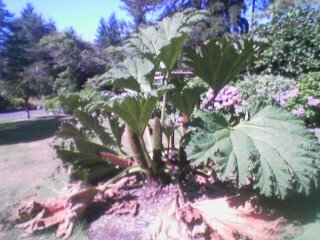 I know what it is... Gunnera tinctoria. My parents had a huge one at their last home. It is a cool plant. I goofed my parents had this type. Yours could be this but it looks way too small.